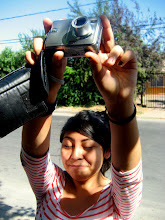 featuring the work of ten young women from Hogar Aldea María Reina and Hogar Nuestra Señora de la Paz of Puente Alto, Santiago de Chile. The opening will take place this Thursday, May 24th, at 6.30pm, in the Instituto Profesional ARCOS, a prestigious visual arts institute near Plaza de Armas in Santiago's center. All participants will be in attendance! Many more girls and young women will be present to share in the opening festivities. 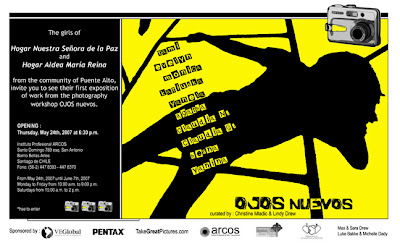 If you are in Santiago or know someone who is, please spread the word, and stay tuned for postings of their work. Congratulations to all ten participants and the many other girls who have been able to enjoy the cameras. After plastic cups of chocolate milk, marraqueta bread with butter, and a short nap, four teenage girls, the subdirector of the hogar, two extra volunteers and I filed off the bus at the terminal in Valparaíso. Full of anticipation, none of the four young women had ever visited the city before; this would also be the first time our taller had ever left the Santiago city limits. I had passed out the cameras on the bus so the girls could document the two hour ride, and as we left the terminal to the east of the city everyone was smiling and chatting with excitement. 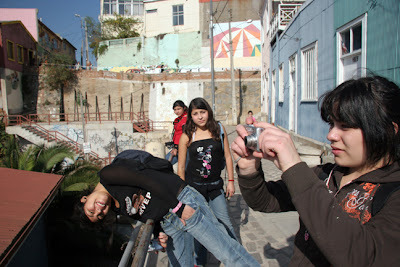 Briefly explaining the purported reputation of Valparaíso as being unique in its beauty but dangerous in its layout– tiny, winding streets ideal for quick robberies– the girls tucked their cameras safely out of sight and grabbed each otheŕs arms as we headed towards the center. I didn’t even see it happen, really. We were waiting at a stoplight, and as I turned around to join the conversation a man ran into the center of our group, bumping into a few girls and then took off running. Still close to the bustling crowds around the bus terminal, he blended in and we lost him quickly as he darted between trucks, cars and street vendors. One fo my girls looked down to see the camera strap around her neck dangling empty, and I became instantly filled with rage at the implications of the episode. Besides the fact that we only have a limited number of cameras and resources, the camera could potentially be replaced. But this particular girl sometimes has difficulty feeling motivated to participate in group activities. Now she felt irresponsible, she felt she was to blame, and she didn’t think she wanted to take pictures that day; of all the people to rob, I wish it wouldn’t have been her. The best thing for us to do was to forget about the camera. There was nothing we could do but continue with our day and hoping she would change her mind, I explained that we could all share cameras and take turns with the video camera I had brought as well. We quickly moved on. Even though the late morning dulled the city with gloomy clouds and a brisk chill, the newness of the city brought everyone’s spirits up. 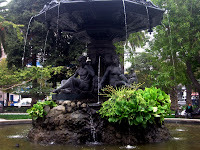 But even in just the first plaza we crossed, the girls shuffled around exploring every detail in the tiled patterns in the ground, the carved women of the fountain, the people sitting on the benches with the morning newspaper or with their kids. 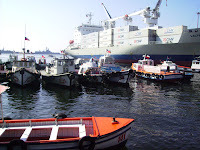 Valparaíso is a coastal city with a historically important port. In the late 19th century, ships traveling between the Atlantic and the Pacific, through the Strait of Magellan, would stop in Valparaíso, which is one of the reasons for its international influences and cultural vitality which it still retains to this day. The city rolls over hills and tucks into corners, a series of acensores assisting with the steep inclines. We spent the first part of our day strolling through the city over to the port, and during this walk the clouds completely broke and we arrived at the ocean with the sun. The ships mesmerized the girls, we sat on the cement steps and watched the waves bounce the smaller boats around like toys. After the port, we decided to climb one of the hills; it was much more my decision than anyone else’s, and I definitely had to do a lot of encouraging to get us all the way to the top. The panorama of the bay spread out before us with saturated colors and deep shadows. Sidewalks and pathways wound around sharp corners and stopped and started whenever they felt like it. The graffiti along the way intrigued everyone– we definitely have our fair share of graffiti in Santiago, but here there were also many murals and more artistic designs and scenes. With everything new and interesting before them, they took pictures constantly. We had to have stopped every 5 meters as someone found some detail or reflection of interest. I tried very much to encourage more portraiture, but only the oldest participant really ever found the courage to stick her camera right into the faces of strangers and capture them for just a moment. We took an acensor down, and even though there are drastic differences between these teenage girls and the ones from my past in the Chicago suburbs, there are still many similarities. The old, rickity wooden elevator jerked into motion and set off a series of high pitched squeals that kept me laughing the whole way down. The ride was definitely worth the $2.80 investment. With an hour to spare before we needed to catch the bus home, we found an amusement park set up in another plaza. Before I knew it, a highly competitive game of foosball had erupted and had all of my girls and the volunteers playing and jumping around. We watched little kids waving to their moms and dads from plastic horses riding in circles, and I wondered if these girls had ever been able to do that before. When they caught sight of the swings, these teenagers, with their black sweatshirts and matching fingernails, with their eyeliner and tough attitudes, revealed that they’re still kids. They swung with smiles on their faces, they swung in all seriousness, watching something I couldn’t see, beyond the plaza, beyond the hills. We took turns pushing them, I took their photos as they flew past. By the time we looked at the clock we had to sprint all the way back to the bus terminal. Gasping for breath we settled into our seats and fell asleep as the sun set outside the giant windows of the bus. If you ask me if the trip was a success I would ask you how you measure success. Did they take amazing photos? Incidentally, they did. Did a camera get stolen? Unfortunately yes, but later in the day this young woman did decide to take photos, when she regained some confidence, and so we don’t even mention the camera. Everyone was safe. We shared jokes, our photography, the pain of walking uphill forever, and hard-boiled eggs. For me, I know without a doubt that it was a success, that the girls had an opportunity that they wouldn’t have had otherwise. Please visit flickr to see our photographs from this trip. Barrick Gold is a mining company from Canada who has mines all over the world: North America, South America, Africa, and in Australia and the Pacific. 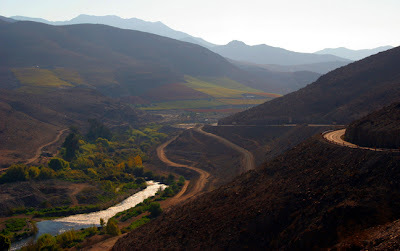 One possible mining project in the north of Chile, seven years after being proposed but still waiting to break ground, is the controversial project Pascua-Lama. Pascua-Lama is a mountain that sits on the border of Chile and Argentina- Pascua being the name on the Chilean side, Lama being the Argentinian name. In the middle of the driest region in Chile, Pascua-Lama's glaciers are a critical source of natural water for the whole Huasco Valley. These glaciers create the Huasco river which runs across the width of the country to the Pacific Ocean. The mountain contains large deposits of gold, silver, and copper, which will be mined over the estimated period of time of 20 years. A highly debated project, those in favor say that Barrick will bring jobs to the Huasco Valley which suffers from staggering unemployment. Those against the project argue that the damage to nearby glaciers and environmental contamination do not justify the promised jobs and question whether the people of the Huasco Valley even have the skills to be accepted as workers with the company. Mining has long been the driving force behind Chile's economy. Companies from around the world have been involved in the mining scene on varying levels. Chile's mineral deposits have been the source of profit and destruction for hundreds of years, and the politics of mines, the rights of companies and those of miners have continually been debated. Pascua-Lama has technically been approved by the Chilean government, and some-- like the Barrick website-- may argue that is has also been accepted by the inhabitants of the Huasco Valley. Upon my recent return from a second trip into the Huasco Valley, I will begin to dissect what my team and I are learning about the project and about the mining industry. When I first read about the Pascua-Lama project, I had already been in Chile for 4 months. An article appeared on the BBC World News website debating some of the key issues at hand such as contamination and unemployment. As I began to read articles online severely criticizing Barrick Gold and viciously condemning the Pascua-Lama project as an environmental disaster, I decided to plan a trip to the valley to speak directly with the people there and see if the 94% of the farmers and water users who Barrick says voted in favor of the project truly embrace it. What we discovered is a complicated fight that involves multiple countries and their governments, a cast of powerful individuals who are so invested in the project you have to wonder why, an agricultural valley with a history that dates back before the Incas, and a mountain of gold that has this huge corporation willing to do anything to move forward with their plans. Some say that Chile, still referenced as a developing country, needs this mine and needs the jobs. Some may argue that this is the way the world works, and if not Barrick, then another corporation will move in and do the same. Others favor the valley, the environment, and those who have been living for centuries working the land. With the project approved but stuck on a legal debate, many in the valley still have hope that they can stop it. For both sides, each day is crucial.